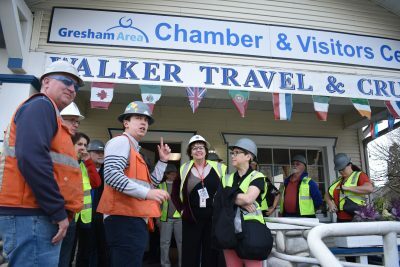 Thanks to the Gresham Chamber of Commerce, Gresham Ford, and Fortis Architecture for sponsoring a “Try Local Tuesday” tour of the Gresham High School Construction Site. 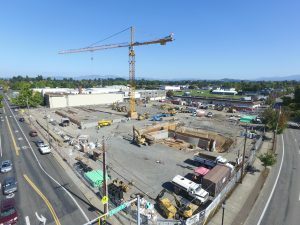 When students arrive at the Gresham High School campus in time for the 2019-2020 school year, there will be 53 new classrooms at Gresham High School, 8 of them science classrooms. The new courtyard will be open, complete with the muse garden including many of the original statues that fronted Gresham High School along Main Street. The new choir, band and black box theater will be ready for students, as well as the new auto body shop. 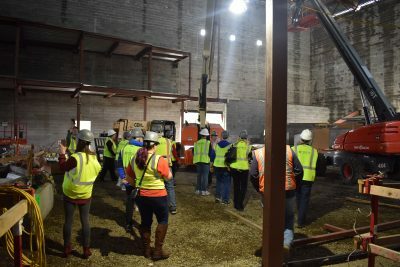 The new auditorium at Gresham High School will be ready for student performances in January of 2020, and after that construction crews will be focusing on building a new gymnasium and expanding the kitchen space in GHS’s cafeteria. 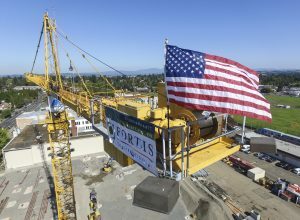 This month, construction crews installed the largest crane in Gresham’s history at the Gresham High School construction site. 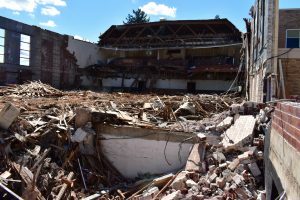 Demolition of the existing auditorium is complete. Footings for orchestra pit of the new auditorium, and tower crane pad are excavated. The crane is scheduled to arrive on September 18th. Reinforcing steel is being installed preparing for concrete placement. Site utilities are starting to be installed including onsite sanitary, storm, and electrical. After this past spring’s exciting groundbreaking ceremony, demolition is well-underway at Gresham High School. Construction crews have already demolished the auto body classroom, the childcare center, and are finishing the deconstruction of the old auditorium and childcare center. 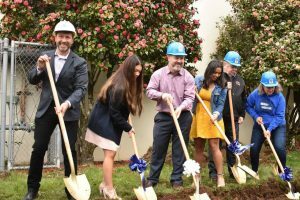 Mayor Bemis joins students and GBSD Board Members in this April’s groundbreaking ceremony for the new Gresham High School. 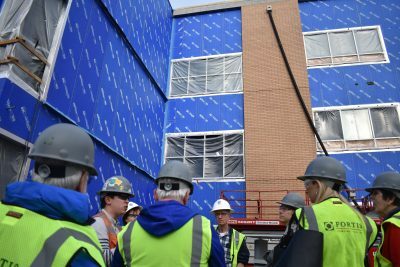 “Gresham High School students in 2020 will have access to a state-of-the-art building. The new school will have technology unthinkable to previous generations. Through community input the design team learned the building’s facade was a point of pride and should be incorporated into the new design. 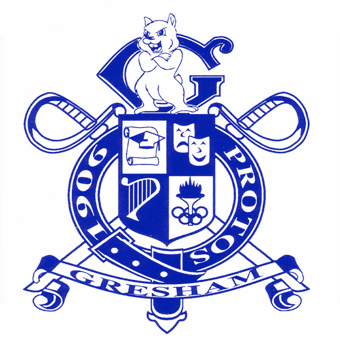 The district has been working closely with the City and the Design Commission to create a design and site plan for Gresham High school that meets the goals and objectives of all interested parties. On May 3, 2017 the district met with the Design Commission to present a preliminary design for GHS. 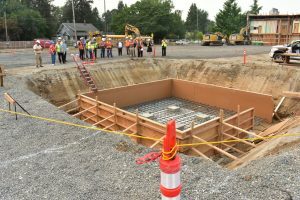 Based on comments received at the May 3rd Design Commission meeting and numerous meetings with City of Gresham staff and community members, the design of future improvements at Gresham High School has evolved. The refined design balances budget limitations, school program and security needs, site constraints and deeply held community feelings towards Gresham High School. The outcome is a refined design that will meet school program and security needs while respecting more of the community’s desire to preserve the context of the building and, at the same time, create more of a gateway presence at the key intersection of Division and Main. The new school design puts student access, health, safety and security as a top priority. The school will be barrier free to anyone with mobility, vision or auditory limitations. Student, teachers and administrators will have access to all community building gathering places. 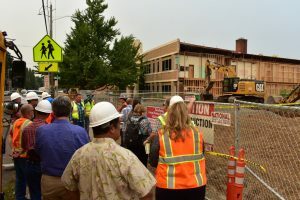 The partially replaced high school will create an easily monitored environment where administrators and teachers are comfortable in knowing who has been greeted and screened to enter the school. Clean indoor air quality and access to day-lighting will reduce absenteeism, improve classroom teaching and test scores. A series of new “porches” along Main and Division will create a highly activated streetscape. The main entry points are slightly elevated above street level to add prominence and ascension up and into the school. The continuation of the finish floor lines, create an architectural base of the school. At street level the porch edges will be used as benches and casual gathering places. The porches are accessible from the street level by integrated ramps rising up to front, welcoming outdoor vestibules that clearly identify entry and access. The school entry points are clearly connected to mid-block pedestrian crosswalks along Main and Division; but, most prominently at the corner of Main and Division. The overhead protected walkway along the Division side of the school directs pedestrians other school entrances to an east. 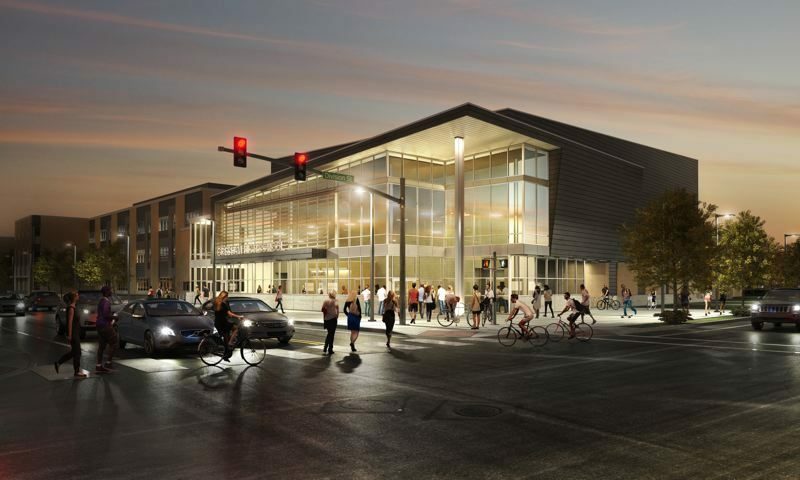 The most visually distinguishing element of the school’s exterior is the highly transparent entrance lobby to the theater at the corner of Main and Division. The activated entry will be a visually prominent architectural statement with elevated entry base, recessed doorway, and deep overhanging projected façade and sunshade. The theater will anchor the northern end of the Main Street and downtown Gresham. The iconic entry will be The Gateway to Gresham as intended in the downtown redevelopment plan. 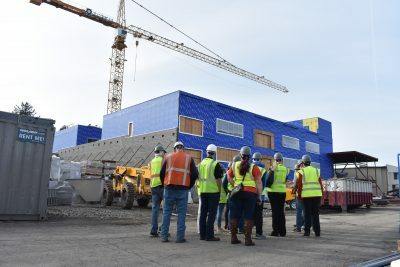 The partially replaced High School will reduce waste and save energy by including sustainable design practices such as exterior sunshades, efficient exterior walls and roofs, storm-water management, recycling of waste and repurposing of historic elements. The school’s 1940’s WPA façade will be honored in concept and detail. The flanking, massive “bookends” will be reconstructed and adorned with the original artifacts – athletic sculptures, Greek goddesses’ statuary and rosettes. The memorable façades will continue to dominate the Main Street façade. The historic gingko trees will remain. In the center, beyond the trees, symmetrically balanced in a courtyard will be new focal structure on which the main entry “sage” sculptures will be redisplayed. 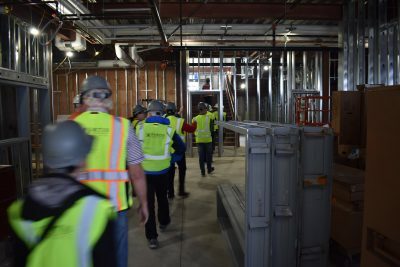 When students arrive at the Gresham High School campus in time for the 2019-2020 school year, there will be 53 new classrooms at Gresham High School, 8 of them science classrooms. The new courtyard will be open, complete with the muse garden including many of the original statues that fronted Gresham High School along Main Street. The new choir, band and black box theater will be ready for students, as well as the new auto body shop. 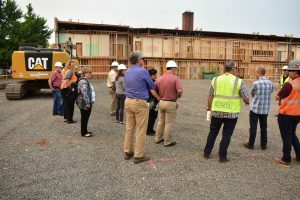 The new auditorium at Gresham High School will be ready for student performances in January of 2020, and after that construction crews will be focusing on building a new gymnasium and expanding the kitchen space in GHS’s cafeteria. At the request of the district, Principal Michael Schaefer convened a group of GHS teachers and staff to advise the district on their needs, desire and priorities for the GHS bond project. 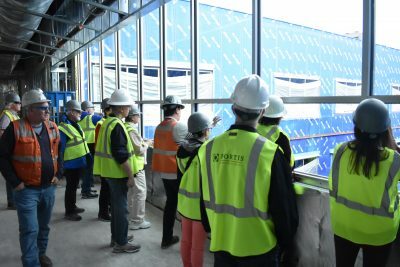 This building design team has spent numerous hours working with the architects and construction management team to provide important feedback as the design phase of the project has progressed. January 25 – February 2, 2017 – Four half/full day meetings with GHS Site-Based Building Design Teams. The ten participants spent over 28 hours reviewing and refining plans including site visitation to Roosevelt High School. April 10-14, 2017 – All Staff (92 employees) opportunities to meet and discuss specific design needs with design team. April 10-14, 2017 – Design team met with 7 student groups to solicit feedback on proposed design. Surveys distributed to staff and available to public for input. Gresham-Barlow School District, in partnership with Fortis Architecture, have set up a live camera monitoring progress on the renovations underway at Gresham High School.